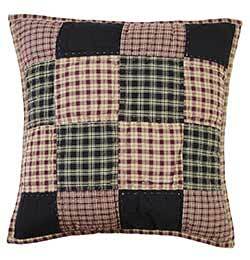 Add warmth and comfort to your country primitive bedroom with the Plum Creek patchwork quilt set, featuring four-patch squares and star in a mix of solid and plaid fabrics. 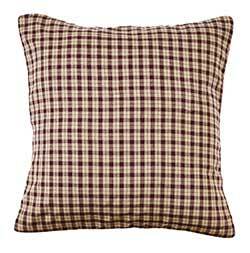 Designed to coordinate with the Plum Creek quilt, this 16 inch pillow cover is made with cream and plum plaid fabric. 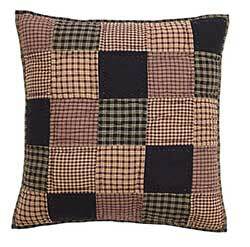 Designed to coordinate with the Plum Creek quilt, this 16 inch pillow cover is made with quilted patchwork blocks in black, plum, and cream homespun fabrics. 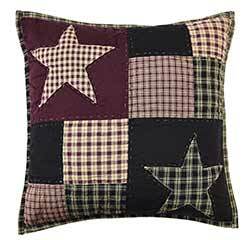 Designed to coordinate with the Plum Creek quilt, this 16 inch pillow cover is made with quilted patchwork blocks and applique stars in black, plum, and cream homespun fabrics. 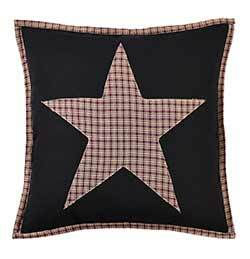 Designed to coordinate with the Plum Creek quilt, this 16 inch pillow cover features a plum and cream plaid applique star and trim, with a solid black background. 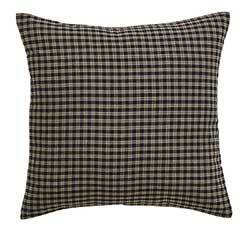 Designed to coordinate with the Plum Creek quilt, this euro sized sham features a classic primitive black plaid fabric. 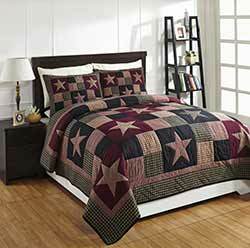 Add warmth and comfort to your country primitive bedroom with this patchwork quilt set, featuring four-patch squares and star in a mix of solid and plaid fabrics. 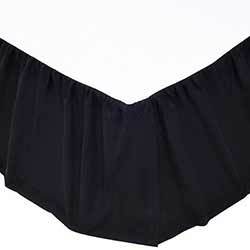 This is for the King size quilt set. 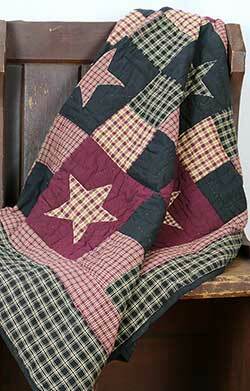 Add warmth and comfort to your country primitive bedroom with this patchwork quilt set, featuring four-patch squares and star in a mix of solid and plaid fabrics. This is for the Queen size quilt set. Designed to coordinate with the Plum Creek quilt, this euro sized sham is made with quilted patchwork blocks in black, plum, and cream homespun fabrics. Add warmth and comfort to your country primitive bedroom with this patchwork quilt, featuring four-patch squares and star in a mix of solid and plaid fabrics. This is for the throw size quilt. Add warmth and comfort to your country primitive bathroom with this patchwork shower curtain, featuring four-patch squares and stars in a mix of solid and plaid fabrics.